I could not be more thrilled to have Regina and Dan St. John (Chena River Marblers) as the first interview in the Meet the Marbler series. The St. Johns are the real marbling deal. I consider myself incredibly fortunate to have taken a marbling class from them (you can find the rest of their 2018 teaching schedule here). Generous in the sharing of their technical expertise and historical knowledge and deeply passionate about the art form, their enthusiasm for unearthing old-school ways and interpreting them with modern twists is a true gift to today's marblers. While taking in their interview, it became obvious to me that all their adventures contribute significantly to the soul of their marbled papers and the spirit of their classroom. And by that I mean: when you hold a marbled paper created by Regina and Dan or are at the marbling tank alongside them, the air VIBRATES with their love for the art from that has been shaped and molded by their unique life experiences, sense of curiosity, and joy of discovery. I hope you find their marbling story as fascinating as I do. It is such a fun and intimate look into the marbling journey of two of the most multifaceted marblers out there. You have been marbling since the 80s, back when the art form was relatively new to the US and was practiced by only a handful of curious and patient artists. What attracted you to marbling and why were you compelled to learn how to do it? We have been marbling since 1984, shortly after returning home to Amherst, Mass., after 15 years of teaching in rural Alaska. The energy came from Genie. She had bought a greeting card with a strip of hand-marbled paper pasted on it wondered if many people were still doing the craft. Well, Amherst is near Northampton which is listed as #1 in Small Art Cities. It was particularly strong in all manner of book arts and she was able to locate a practicing production marbler, Faith Harrison. After one short class, the die was cast. That was all she wanted to do in life! I was sucked into it all. Very occupied teaching physics and chemistry in a local high school, I had to take some woodworking classes so I could build her tanks, combs, and craft-fair display furniture. Then I had to study some bookbinding so I could help make products to sell from the piles of newly marbled paper. Then I had to make a 10-foot long tank with full sets of combs and spend weekends bustling around applying paints and holding the other end of three yards of silk for making ties and scarves to sell at a growing number of craft events. So that's how Genie was attracted to marbling and how was I compelled to learn how to do it! Dan makes all the watercolor paints for their Classic Watercolor Marbling class. Dan also makes red and black acrylic paints for the Acrylic Marbling Class. One of the things I really like about the two of you is the way you bring the science of marbling into the studio and the classroom. You have researched and experimented with additives and formulas dating back centuries into the world of traditional marbling. Which came first; the interest in marbling which lead to the science or the science which lead to an interest in marbling? Genie and I taught for many years in some of the most remote villages in the United States. We taught on St. George Island, Ala.—2600 miles from Fairbanks and right in the middle of the Bering Sea—for three years. We taught two years in the Village of Allakaket, an Athapascan/Eskimo Village straddling the Arctic Circle on the upper branch of the Yukon River. We were both awarded Ford Leadership Fellowships which paid us for a year of travel and study to places in the world which might help us better function as Alaskan educators and specifically to learn how to teach science and math in a more creative, hands-on manner. That year, we spent several months traveling to the Mountain View Environmental Educational Center in Boulder, Colo., learning centers on the Sioux Reservation at Pine Ridge, the Navaho Reservation, Folk Centers in Georgia and Tennessee, village schools in rural England, and a big trip to Siberia! In our years of teaching, we always tried to incorporate what we had learned from our Ford year into our activities. Returning and readjusting to life in Amherst was challenging for both of us. Massachusetts did not recognize our Alaskan teaching credentials and we both had to go back to college to get certified. I got certified in teaching Physics and Chemistry and Genie got an elementary teaching certificate but did not like the school environments (she also had four school-age children at home!). In 1992 we decided to join forces and become a marbling company. I left off teaching and we spent our life savings on having the house modified to serve as both a marbling and bookbinding studio. Genie emphasized marbling and I emphasized bookbinding and we both worked very hard making and selling products at as many as 30 craft fairs a year and supplying dozens of small shops. Around 2010, Garret and Gretchen Dixon walked into our booth at a four-day craft fair and our life changed. They gave us a fistful of the most beautiful Classic Marbled Papers we had ever seen: Tiger Eye, Shell, Stormont, Italian Vein, etc. and they invited us to spend a few days with them in their small studio in the basement of their house in Pennsylvania. The unique combination of physics and chemistry involved in producing a Tiger Eye pattern brought it all back to me. This is where art and science meet! Since that time, I have dropped almost all other pursuits: bookbinding, woodturning, etc. and devoted myself to the study and practice of Classic Marbling as it was in the 19th Century and earlier. You also are experimenters in the studio, making funky tools or coming up with interesting techniques that influence modern marbling. Can you share an example of something you created for fun and the story behind it? I have been interested in the way Galen Berry created the “Balloon Pattern.” Some 20 years ago, I made three combs which seemed to work: I sold two and kept one at home on the shelf. Recently, while teaching an acrylic marbling class in Ashville, N. C., it just so happened that Mimi Schleicher, the author of the text we teach from, was in the class. It turned out that she still had one of those combs. She brought it to class and in the last hour, I tried it out. Lo and behold! I produced a complete, full Balloon Pattern. I have just made a better comb and had a friend laser cut me a track for it to ride on. In the near future, I will demonstrate it on Facebook and show everyone the secret! Have you always been a wife and husband marbling team or did one of you influence the other to start practicing? Genie and I have been together for 54 years since we met in a Summer Russian Class at UMass in 1964. She was so interested in marbling, I was afraid I would lose her if I didn’t somehow join in! How has the art form changed from the days when you first started marbling? The art has significantly declined over the years. Many of the older generation have passed away or just stopped being active marblers. The books are written but all have long gone out of print. There is no wonderful Ink & Gall* being published. Conferences are hardly held anymore. The last one in the US was some 15 years ago in Gatlinburg, Tenn. The 2016 International Ebru Congress in Istanbul, Turkey was not attended by many marblers from the US or the rest of the world: 32 foreign marblers, none from England or Germany. In England, paper marbling is considered “a critically endangered heritage craft.” We do see that Ebru is very much alive and supported by the government in Turkey. We see a lot of interest in marbling in Eastern Europe. The 5th World Ebru Day was held in Prague in the fall of 2016. There is a lot of interest by people to learn how to marble and we do the best we can to help. *Editor's note: Ink & Gall was a printed marbling journal published by Polly Fox and Dexter Ing from 1987 until a fire destroyed their studio in Taos, New Mexico in 1991. How would you describe your marbling style (i.e., traditional, contemporary, experimental, modern, etc.) and why do you approach the art form that way? Our marbling style is all of those things: it is very traditional in that we go back to the very roots of marbling. We have an extensive collection of books on marbling which we refer to constantly and try to make available to people. We publish Mimi Schleicher’s books and sell them. We encouraged Diane Maurer to republish her book, The Ultimate Marbling Handbook, and help her sell it. We help Antonio Vélez Celemn sell his book, El Marmoleado. We have made copies of Fichtenberg, Woolnough and Halfer* and make them available (we are helping Oak Knoll Press sell the new addition of Richard Wolfe’s book and his new version of Halfer). I have written a manual describing Classic Marbling and Genie will be working on a book on acrylic marbling as soon as time permits. We have plans to study Turkish Ebru in Istanbul with a master artist there. We follow the work of Jake Benson who is doing important groundwork in studying the origins of marbling in the Middle East, Central Asia, and India. We are very experimental in our marbling at home and in our work teaching. New combs and techniques are constantly being tested and the old patterns are studied to see if we can duplicate them. All of this energizes us and inspires our students! We keep no marbling secrets and are totally committed to offering workshops and information at the very highest level in hopes that the trade/craft will flourish. Our students constantly discover unique and beautiful patterns using our new equipment. If it is repeatable and they can teach it to us, it lives on. We name the new patterns after them and teach it to future students! * Editor's note: These are some of the original books documenting the formulas and techniques of marbling. The New and Complete Manual of Fancy Papers by M. Fichtenberg, 1852; The Whole Art of Marbling by C.W. Woolnough, 1881; The Progress of the Marbling Art by Josef Halfer, 1894. Most modern marblers in the US today use commercially made paints but you primarily marble using paints you’ve prepared yourself. What affect does making your own paints have on the way you approach marbling? In other words, do you marble differently when you use commercial paints versus when you use your own paints? We use both commercial paints as well as paints we make ourselves. Over the past 34 years, Genie has come to prefer Utrecht paints over others. Because no company sells a solid black, we make our own using the Utrecht Matte Medium as the binder. We also make a dark Cadmium Red and a Studio Red because those important colors are not available or don’t behave themselves. In Classic Watercolor Marbling, I make it a point to make the paints, including the rabbit hide glue/gum tragacanth binders and the beeswax glazing paste which enables us to polish the papers. I do, however, use commercial gouaches by Winsor & Newton to make Tiger Eye in classes because the preferred method by Fichtenberg calls for the use of a very caustic chemical called Potassium Hydroxide. We have found that in certain circumstances you can combine the use of commercial watercolors in acrylic marbling. Gouache Tiger Eyes and Stormont patterns can be thrown down on acrylic paints. Yes. I have to some extent joined the Steampunk Movement and have purchased some of their apparel. If I am in a very experimental mood and am about to use my mechanical three-roller paint making machine from China, I put on my Steampunk hat and googles! I am not averse to using modern technology. Yes! Both Genie and I admire Garret Dixon, a rehabilitation doctor in Franklyn, Pa. In his basement with a tattered original French edition of Fichtenberg, he managed to teach himself to be a world-class marbler. His papers are exquisite! In his generosity, he invited me to spend three days learning his techniques. We learned how to manage surface tension, make our own paints, and become comfortable in doing Tiger Eye, Stormont, French Shell, and others. He reads in great depth in French and German sources. He has helped us in bringing back to life Classic Marbling! Richard Wolf has to be mentioned also for his scholarship and accomplishments in marbling. Through marbling, what have you discovered about yourself? I have discovered that I can be an artist. Keeping focused. There is so much to do: so much to read, so much to try, so many ways to reach out! We focus on teaching marbling now and put that ahead of everything, except our growing family and urge to travel. Take a class from a good marbler to get going. It will save you from a lot of frustrations. Books are hard to come by and the quality of the information available on the internet is mixed. Where does the name Chena River Marblers come from? It comes from 16 years of intense living in Alaska. The Chena River runs right through Fairbanks and we lived the last 10 years of our life there on the Chena Ridge Road right above it. From the University of Alaska, Fairbanks you can see before you the Matanuska Valley, and behind that rises Mount McKinley. Summers brought rainbows that arched across the entire sky and the midnight sun. Winter nights brought memorable cold and the northern lights. Genie and I shared a wonderful Alaskan experience. We worked together teaching in small village schools and raised four children there. Marbling and teaching marbling together are a continuation of that shared working life. Are you working on any new marbling projects or have any marbling news you are excited to share? We are working on a number of new marbling projects. We have developed several new combs which are helping us discover a number of new and beautiful patterns. Beyond that there are conversations going on about a possible marbling conference in this country. One other thing is happening of special interest. We will be hosting Professor Spencer Smith of the Mt. Holyoke College Physics Department. He and an associate are coming here to study viscosity in marbling. In addition, Aubrey Jaffers of the MIT Artificial Intelligence Lab is coming with a colleague to test some of the assumptions he has made in modeling marbled patterns mathematically. 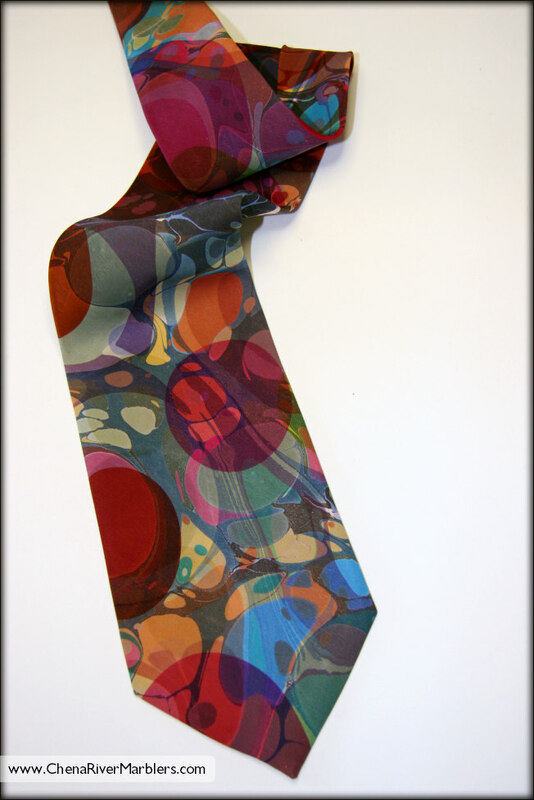 He has just recently delivered some papers at Cambridge University in England on the mathematics of marbling, referencing our marbled patterns on ties he has bought from us over several years! Yes! Our daughter-in-law is a professor of Computer Science at Mt. Holyoke College and has received a number of grants to encourage women in the tech fields. They have been funded to build a large “Maker Space” at the college. We think that marbling may find a pleasant home there!! !